Behind the French Menu: Dorade Grise or Griset - Black Seabream. 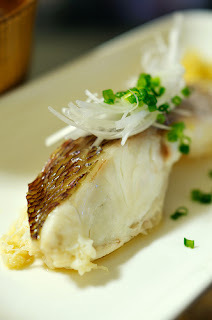 Black Seabream in French Cuisine. Dorade Grise or Griset - Black Seabream. 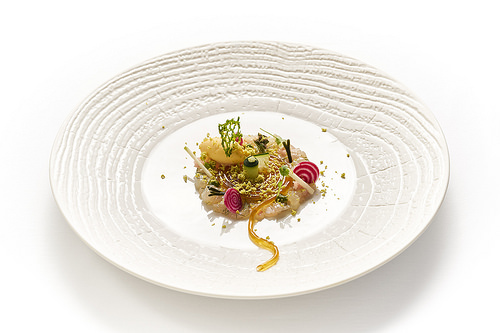 Black Seabream in French Cuisine. Black seabream in a French supermarket. Dorade Gris - Black Seabream. Worry not, this fish is not black at all, it has blue-grey metallic skin and scales and when cooked the inside has a shimmering white, tasty, and slightly flaky meat. The fish on your menu are caught in the open sea and since they average 30 to 40 cm (14 – 16 inches) they are mostly too large to be served as a whole fish for one, and you will probably be offered a filet. Black seabream will be on menus all over France as they are caught both in the Mediterranean and the Northern Atlantic. They will be offered grilled, fried, poached, or baked. 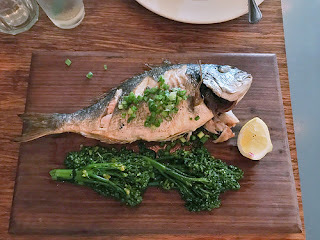 Other members of the sea bream family may be on menus elsewhere including some species that are farmed and they are often smaller and may be offered as a whole fish for one. Fish from the open sea may sometimes have their name qualified with the word sauvage, wild. (The French word sauvage came to English as savage and, of course, in the plural as savages). Other French menus may note "de Ligne" indicating fish caught with a line and so obviously not from a fish farm. Fish from the open sea may not have a very different taste to those from fish farms but they do have a firmer texture and fish are what they eat. Whole grilled seabream with broccolini. Béryx and the Dorade Rose - Red Bream and the Splendid Alfonsino. Dorade, Daurade Royale, or Dorade Royale. Gilthead or Gilthead Sea Bream. Pageot, Pagel, Pageot Commune - Pandora Bream, Common Pandora. Black Seabream labeled a good alternative 11-2018.
when fished off France, Northeast Atlantic Ocean and English Channel. Photograph courtesy of Seafood Watch. that’s fished or farmed in ways that have less impact on the environment. Filet de Dorade Grise à la Plancha, Sauce Vierge et Legumes Croquants – Black seabream braised on the plancha and served with sauce vierge and crunchy vegetables. As its name suggests, sauce vierge includes virgin olive oil (vierge is virgin in French), and France has some fantastic olive oils. Sauce vierge is served warm and in addition to the virgin olive oil is made with fresh tomatoes, garlic, lemon juice, basil, red wine vinegar, salt, and black pepper. Virgin olive oil has a distinctive taste that can only be enjoyed when cold or slightly warm, but not cooked; heat destroys the unique flavor that is the particular delight of a virgin olive oil. Buy ordinary olive oil for cooking and keep those expensive virgin oils for salads and other uncooked recipes. Filet De Dorade Grise À La Nicoise – Black seabream prepared in the manner of Nice. The city of Nice on the Mediterranean coast has its recipes influenced by both Provence and Italy. For a dish like this, there are no hard and fast rules, but the accompaniment will usually be fried tomatoes, baby mauve artichokes, fresh green beans, and possibly green peppers along with Nice’s special black AOP olives all flavored with garlic, and lemon juice. (The Olive de Nice AOP, also called the Olives Noire Niçoises AOP, is one of France’s top-graded olives and usually the most expensive. The same olive is used for Nice’s Huile d'Olive de Nice AOC/AOP – its AOP olive oil from Nice). 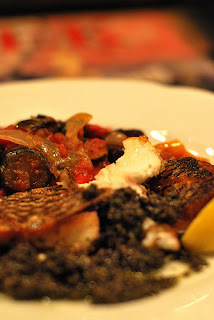 Grilled seabream with a black olive sauce. Dorade Grise, Écrasé de Pommes de Terre au Raifort, Pousses d’Épinards – Black seabream served with hand mashed potatoes flavored with horseradish and spinach sprouts. Filet de Dorade Grise Risotto "Carnaroli" et Fenouil à l'Étouffé - Black seabream served with a carnaroli rice risotto and the stewed bulb of fennel. Carnaroli rice will not be on too many menus as it is the best, and most expensive of Italy's homegrown rice varieties that are used for the best risottos. Arborio and Aldo and other Italian rice varieties may be better-known, but Carnaroli is considered the caviar of risotto rice. So think twice before passing on this menu listing. Filets de Dorade Grise Snackés sur la Peau Huile d'Olive Vierge Ail et Citron – A filet of black seabream lightly fried in its skin with virgin olive oil, garlic, and lemon. The words snackés has its origins in the English word snack, but from there the French usage took off and assumed a totally different meaning with Snaké, Snacké, Snackés Snackées meaning lightly grilled or lightly fried and seared. Filet de Griset Poêlé au Beurre d'Herbes, Mousseline de Panais à la Vanille – Filet of black seabream lightly fried in a herbal butter accompanied by very lightly pureed turnips flavored with vanilla. Mousseline indicates a very light puree; the word comes from the fabric muslin. Before there were metal sieves muslin was used the make sure the puree was suitably fine. The name Griset is one of the black seabream’s optional French names that is also used for the bluntnose six-gill shark. This shark is found in the Mediterranean but its meat is not generally not offered for human consumption, and so it will not be competing for space on the menu. The Griset, or bluntnose six-gill shark is also not considered dangerous to humans, but if you find one avoid sticking a finger in its eye, it may get upset and they can be as long as 4 meters (13 feet). That being said there are some tasty small sharks like the rousette, the piked dogfish called rock salmon in the UK that do reach French menus. Griset may appear on the wine list with a Griset Blanc or a Grise Rosé. Both are IGP Pays d’Oc wines from the old region of Languedoc-Roussillon in the central part of the South of France. Since 1-1-2016 the regions of Languedoc-Roussillon and the region of Midi-Pyrénées are part of the new super region of Occitanie. The grape used for both these wines is the Sauvignon Gris, which began as Bordeaux grape. Despite that, because of France’s wine laws very few wines are permitted to carry the name of the grape that made them on the label; that is if they wish to have an AOC/AOP on their label. The black seabream on the Isle of Mann. A step away from black seabream on French menus. The Isle of Mann is an island in the Irish Sea between Ireland and the UK. While researching some of the names of the Black seabream in different languages I came across, on the FishBase website the name Old Wife for black seabream on the Isle of Mann. 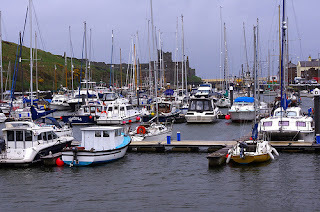 (The Isle of Mann is an independent country with its own 1,000-year-old parliament the Tynwald, and its own Celtic and Nordic based language called Manx). The Isle of Mann is connected to the UK as a crown dependency, but it is neither part of the UK nor part of the EU; that is quite an achievement. The Isle of Mann is famous for quite a number of things, not the least of which is the Isle of Mann TT Motorcycle races held annually around the end of May or beginning of June. Also unique to the Isle of Mann is a unique breed of Manx cats that have no tails and the only colony of wild Wallabies this side of Australia. 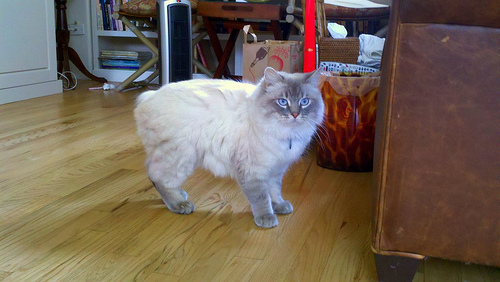 A Rumpy Riser Cymric long-haired tailless Manx cat. On a personal note, my grandfather and father spent some unintended time on the Isle of Mann during WWII, but they were not there for the fishing. Their story is held over for another day. Back to the black seabream from the Isle of Mann. The fish including the black seabream caught around the Isle of Mann command top prices in the markets and I personally can vouch that the Isle of Mann’s kippered herrings are second to none. The name Old Wife for black seabream had me scratching my head as despite my researching the French connection, I also received no help from Dr. Google. Following on that, I emailed a friend who was born on the Isle of Mann and spent most of his care-free summers from 1965 to the late 1970’s fishing there and so he was clearly the go-to man. Unfortunately, today he has to manage European and others' problems of decay and dissipation and on short notice was not able to turn up much information on the origins of the name Old Wife beyond saying that it is only used for dead Black Seabream. From our conversations I know he still dreams of returning to the island for a fishing holiday and if he finds out anything I will update this post. 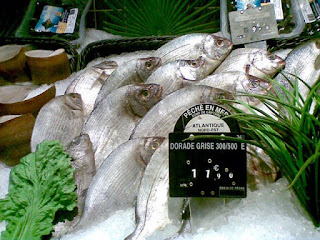 Now back to the black seabream on your menu, in French, it is the Dorade Grise or Griset. Rent a boat to go sea fishing from the Peel Harbour, Isle of Mann. Aiguillat, Saumonette, and Rousette; Rock Salmon in the UK. Small Sharks on French Menus. Basil - Basilic or Herbe Royal. Basil in French Cuisine. The Italian Pesto is Pistou on French Menus. Caviar in France. The Different Caviars on French Menus. Sturgeon, the fish, Esturgeon on French menus. Fenouil - Fennel, the Herb, and the Vegetable. Fennel on French Menus. Haricot or Coco - Beans. Beans in French Cuisine. Tartare - Tartar on French Menus. Steak Tartar, Fish Tartar and Vegetable Tartar. The French Connection and The English Kitchen . Vanille – Vanilla. The story of Vanilla and Vanilla in French Cuisine. Raifort – Horseradish. Horseradish on French Menus. Tomate – Tomato. France’s Greatest Tomato, the Tomate de Marmande AOC. The Tomato in French Cuisine.